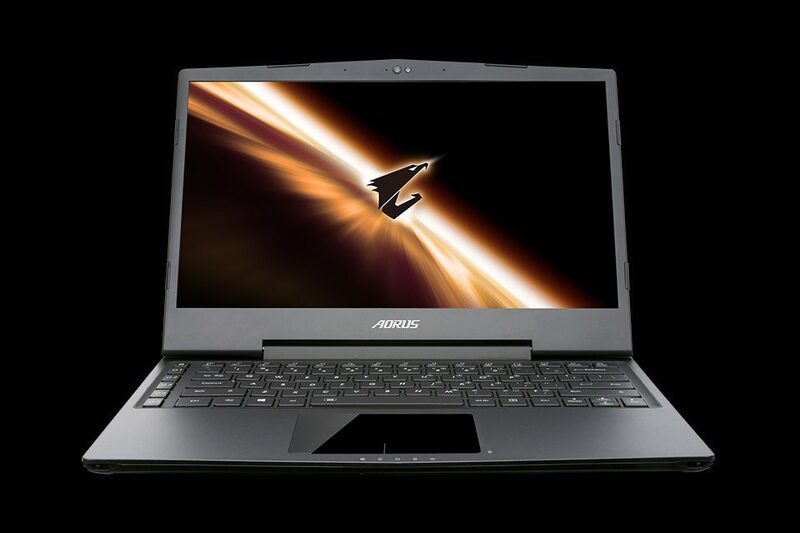 The first Aorus laptop was a titan, a 17-inch behemoth that excelled at gaming on the go with a pair of powerful graphics cards and top-notch specifications all the way around. Despite the X7’s thin design, that laptop was still a hassle to carry around thanks to its impressive dimensions and significant weight. Now Aorus are back with a dramatically more portable gaming laptop, the 13.3-inch X3 and 13.9-inch X3 Plus. While these laptops only have a single graphics card, the remaining specifications are impressive and the inclusion of a new 3K (3200 x 1800) display outdoes even the 17-inch model. On paper this laptop looks top-notch; well worth its £1500 asking price. In this review, we’ll see whether its real-world performance measures up. Note: Specifications are for the model given. For full specifications, please refer to your retailer and/or the Aorus X3 website. The X3 Plus is the spitting image of its larger brother, with a slightly aggressive shape that walks the line between professional class and gaming style. The display is a beauty, with good colours and a 3K resolution of 3200 x 1800. The high resolution causes some complications (as we’ll see later), but as a technical feat it is impressive to behold. 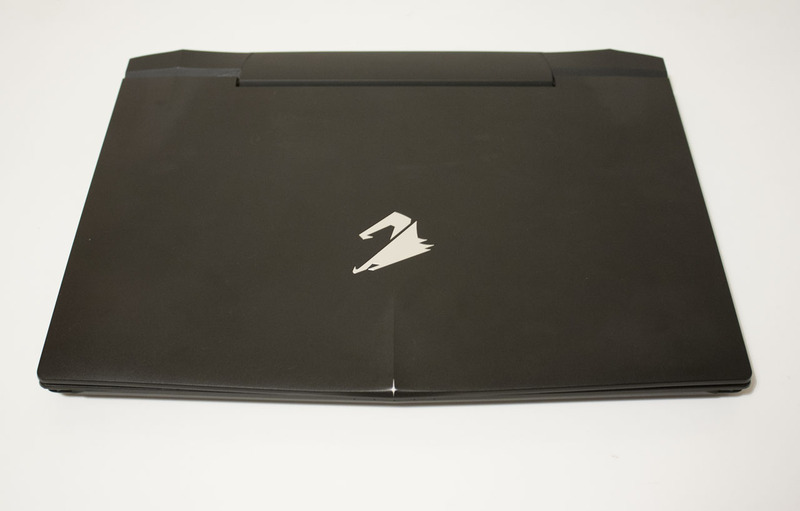 The screen is flanked by a webcam at the top, the silver Aorus logo at the base and a (thankfully rare) sticker on the lower right. 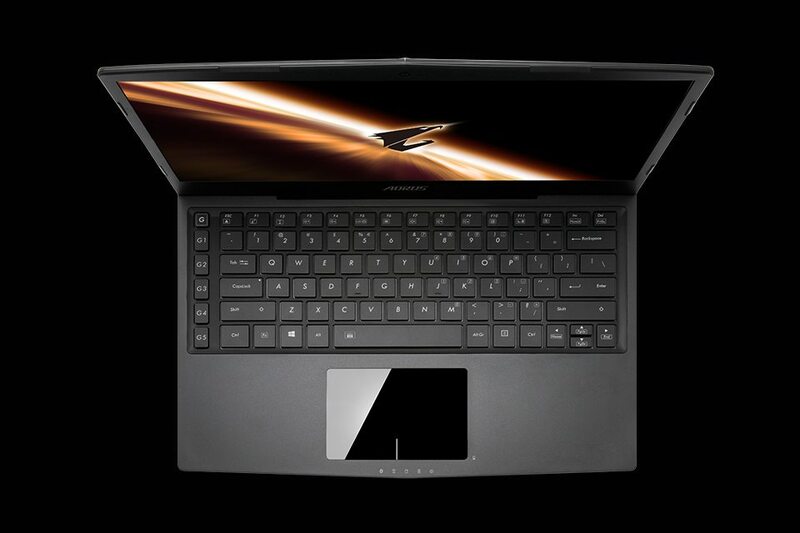 Moving down to the keyboard, we see a similar layout to the Aorus X7. The big difference is that a 13.9-inch frame has no room for a number pad, so this is made into a Function-layer on the right side of the keyboard. The column of macro keys on the far left remains intact, and the layout is as close to standard as you’ll find on a laptop. The keyboard includes white backlighting, which can be set to high, low or off. The key travel of the laptop’s scissor switches isn’t quite ideal, but it’s deep enough to be equally usable for writing or gaming. Below the keyboard we have the glass trackpad. The trackpad is a generous size, with two buttons indicated by a short silver line near its base. Multi-touch is supported as you’d expect, with scrolling, zooming and the usual range of Windows 8 edge gestures. Below the trackpad are five icons for indicator LEDs below, providing the current status of the Bluetooth, wireless, hard drive, battery and backlight. On the left hand side we have some ports: mini DisplayPort, HDMI, USB 2.0 and a pair of 3.5mm jacks for headphones and microphones. 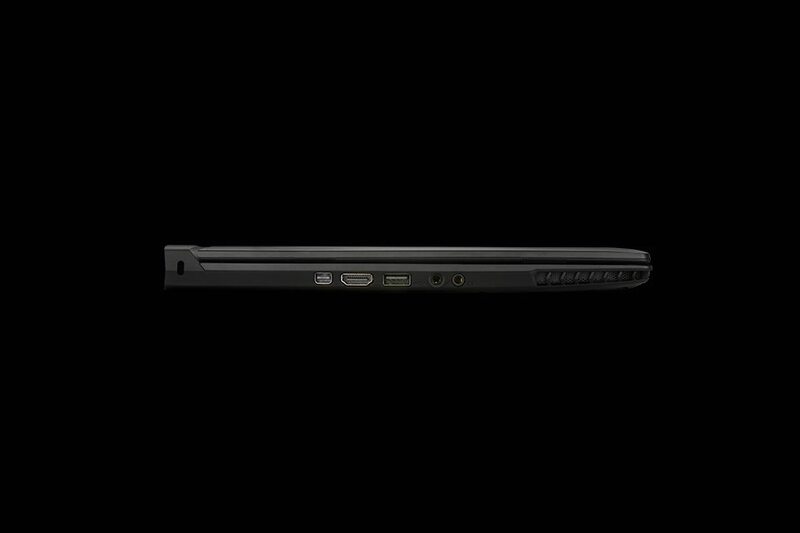 On the right hand side, we have an SD card slot and a pair of USB 3.0 ports plus the power button. On the back we have two further pots: an ethernet port and the AC input. I like the arrangement of these ports, particularly the back-facing ethernet and power, as it ensures you’ll have unfettered access to the left or right of the laptop with your mouse, even in tight spaces. 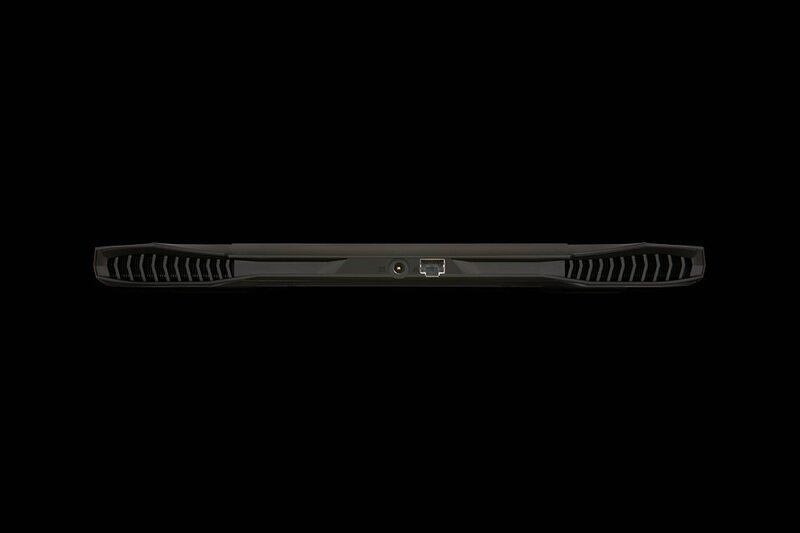 While most laptops are near-perfect rectangles when closed and seen from above, the X3’s large fans extrude from the back and the laptop comes to a gentle point on the front. The lid of the X3 has a slight prow as well, putting in mind the hood of a sports car. On the underside, sharp shapes replace the usual circles and rectangles of grilles and rubber feet. It’s a cool look, particularly in the stark black colour of the Aorus. You’ll find regulatory information in the centre of the laptop, but no easily-removable panel to insert RAM or a new hard drive. Instead, you’ll have to take the entire back off. The body of the Aorus X3 feels solid and well-constructed in the hand, although the screen creaks moving into position on my review unit and flexes enough that I feel a bit anxious actually taking it with me to work – this is a laptop that you’ll really want a good protective case for. 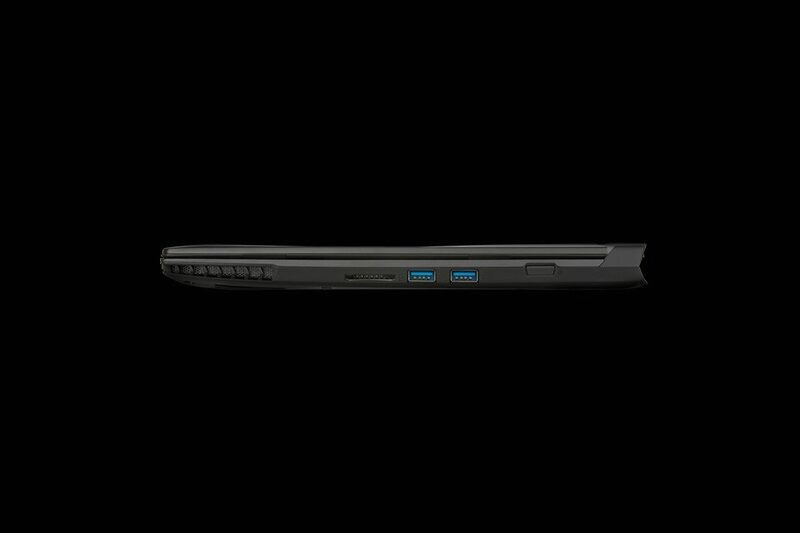 From a design and construction standpoint, the X3 Plus is a well-equipped laptop with a brilliant screen, good input options and a wide range of ports, all stuffed inside a cool-looking and solid-feeling shell. So far so good, but how well does it fare with real-world use? I used the Aorus X3 Plus for two weeks in order to give it a proper evaluation. I used it while at home whenever my PC was occupied, and took it on a couple of train journeys to Birmingham and back to judge its performance both at work and gaming back at the hotel. Here are my impressions. For gaming, the X3 Plus looks well-endowed: a new Core i7 processor, a strong Nvidia GeForce 860M graphics card with a massive 6GB of dedicated video memory. But wringing strong performance out of a gaming laptop is not always easy; thermal and noise issues can drag down an otherwise stellar gaming experience. Thankfully, the X3 Plus seems to handle these potential hazards with ease. While the laptop does get fairly warm and the fans go on, neither are big enough headaches to detract from the overall experience. And that experience is being stunned at the capabilities of this 13-inch laptop. I found that the X3 Plus could handle each title I threw at it, with one caveat: I was rarely able to play at that native 3200×1800 resolution. Instead, I often moved to 1600×900, which resulted in a grainier (but unstretched!) display and massively improved frame-rates. While I did face some issues getting this half-size resolution to be maintained, once things were set up correctly I blasted through many a title. The machine plays modern titles like Call of Duty: Advanced Warfare well at medium settings, while less demanding titles like XCOM: Enemy Within can run at higher settings and sometimes even the full 3200×1800 frame-rate. In general, I was impressed by the X3 Plus’ gaming performance, and pulling my ‘gaming PC’ out a tiny messenger bag never got old. Working on the X3 Plus is quite gratifying, but a few problems reared their head. The resolution was the chief influencer here, causing both delight and consternation during my time with the Aorus. In general, using a 13.9-inch laptop with a 3200 x 1800 resolution is fantastic – text looks incredibly sharp, there’s plenty of real estate to edit photos or video, and 1080p+ films look awesome. Just browsing the web with Chrome is a cool experience, particularly on the 64-bit beta version of Chrome that supports Windows’ modern font rendering. Unfortunately, the resolution can also cause problems, just because it is still so rare. Windows relies on scaling to function; this was set to 250% initially but I dialled it back to 200% for a virtual 1600 x 900 desktop. Windows itself generally looks quite good at this resolution, but many other applications don’t yet support it. That means sometimes you’ll launch an app – like Adobe’s Creative Cloud, for instance – that doesn’t scale at all, and you end up squinting at the screen at an app that’s a quarter the size that it should be. A 3200×1800 screenshot. Click to see full-size. Even worse is when an app partially supports scaling, like Evernote. Then you’ll get a Frankenstein’s monster, with some elements rendering at the correct 200% scale and some remaining near-invisible at 100%. 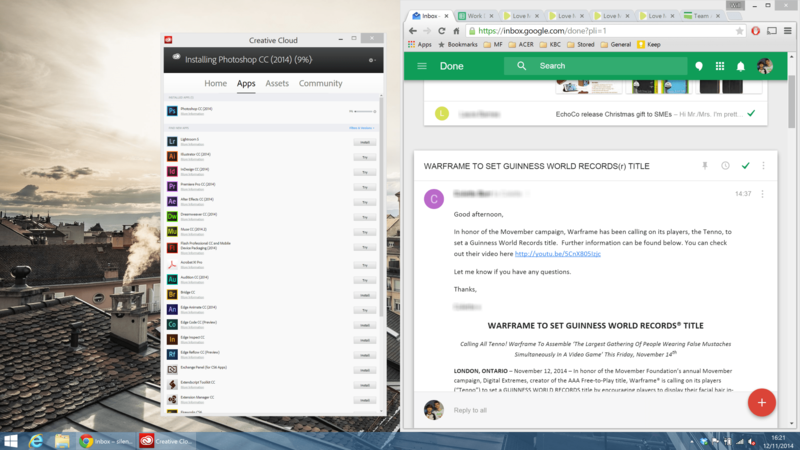 That positively ruins layouts, and pushed me to using Evernote’s properly scaling web interface instead. Finally, you’ll get apps that respect the 200% scaling, but don’t yet have any higher resolution assets to match that resolution, leaving you with pixelated and blurry text, icons and other elements. All three failures are aggravating in their own way, and it’s sure to be quite a few years before all applications receive high resolution support. Evernote. Click to enlarge once again. Outside of the resolution and scaling shenanigans, there’s little to complain about on the Aorus X3 Plus. The laptop’s powerful internals – a Core i7 CPU, 16GB of RAM and a pair of 240GB solid state drives in RAID0 – ensure that programs load quickly and execute fast. I was rarely kept waiting with the X3 Plus, even when starting complex programs like Photoshop. That’s not a massive surprise with a gaming laptop like this one, but it’s still a happy thing to report. Most of my work is to do with typing, and it was here than I was nervous about the X3 Plus’ performance. The keyboard felt a little shallow at first, but I quickly got into the rhythm and found that I could type quickly, accurately and (relatively) quietly; the touchpad also proved reliable and easy to use. Battery life is the final area of contention, and once again the X3 Plus didn’t disappoint. The laptop lasted five hours reliably while running Photoshop, a dozen Chrome browser tabs and the odd bit of messaging software, even at high brightness settings. That’s not a fantastic result for a modern laptop, but it’s good enough for one with a 3K display and a relatively thin 22.9-inch-thick frame. As expected, we see similar results to the P35W v2, a Gigabyte laptop with similar specifications (a slightly worse i7-4710HQ processor and the same GTX 870M 6GB on the same HM87 Express chipset). That’s a good result, given that the P35W v2 is a larger 15.6-inch laptop with necessarily better thermal characteristics than the X3 Plus. 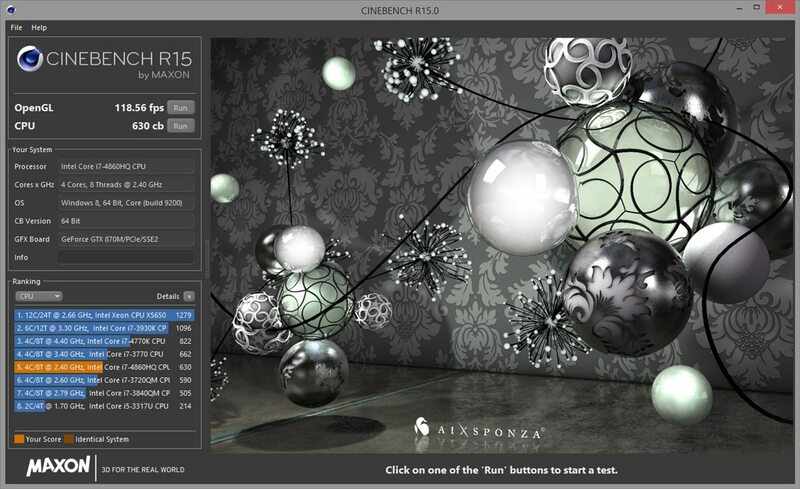 The Aorus X3 Plus brings in some of the highest scores in the Cinebench test, with the superior processor providing a noticeable boost over the otherwise identically equipped P35W v2. Indeed, the results are similar to the Aorus X7 v2; another impressive showing. The X3 Plus records a higher score than any other laptop, which speaks well to the laptop’s Core i7 4860 processor. Despite this triumph, the scores are quite similar here, with top half of the results within 10% of the X3 Plus. Bioshock Infinite is a new addition to our range of benchmarks. I’m running it on the ‘high’ preset at 1080p resolution; the benchmark itself is run from the ‘binaries’ folder of the game’s files if you’d like to compare your current setup to the X3 Plus. The Aorus X3 Plus received an average score of 85.29 fps, with a minimum score of 7.34 fps and a maximum score of 191.56 fps. Metro is a challenging game, both on you and your PC. 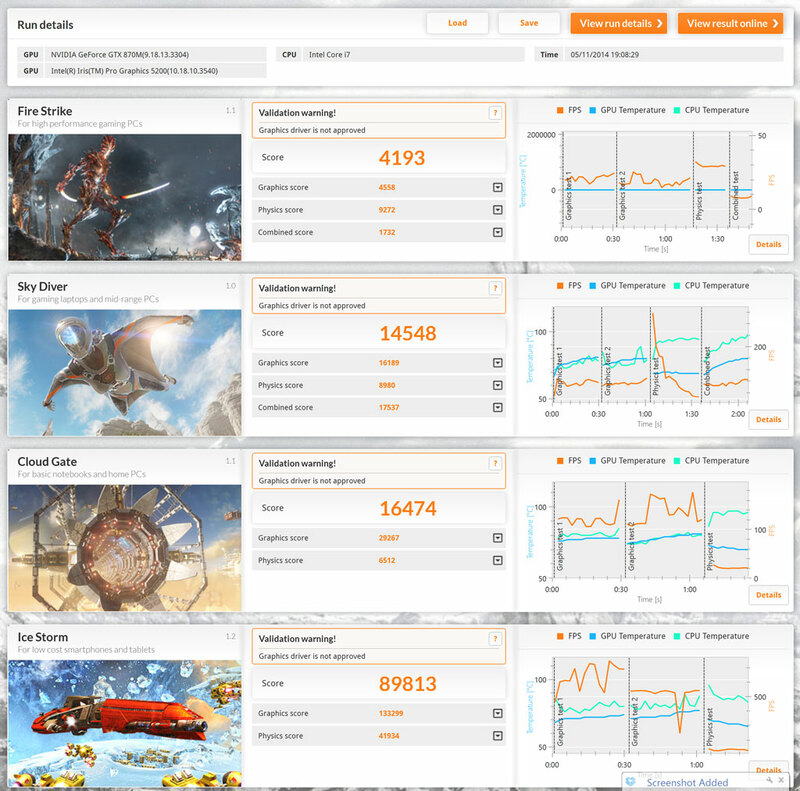 Its benchmark tool is quite formidable, so let’s take a look at how the X3 Plus performs in an actual game. The settings are Direct X 11 renderer, 1920x1080p, High quality, AF 4X filtering, normal motion blur, no SSAA, DirectX 11 tessellation or PhysX. The dual-GPU Aorus X7 v2 received a score of 47 fps here on average, so how does the Aorus X3 compare? Well, the X3 acquits itself reasonably here, with an average of 30 fps at 1080p. That’s reasonably playable, and 45-60 fps seems a reasonable target at 1/4 resolution (1600×900) and medium presets… very good for a 13-inch laptop. The Aorus X7 v2 recorded an average FPS of just 36 in the same test, so getting 47 here is quite a feat and on par with my three year old gaming desktop – not bad at all. It is worth noting that Company of Heroes 2 doesn’t support Crossfire or SLI, which would have otherwise increased the X7 v2’s score. The Aorus X3 Plus is a beautiful laptop, well-equipped with some of the best hardware in the business. Its 3K 13.9-inch display is an absolute marvel, although the high resolution can sometimes cause problems. Ultimately, the X3 Plus is quite possibly the best 13-inch gaming laptop in the world.